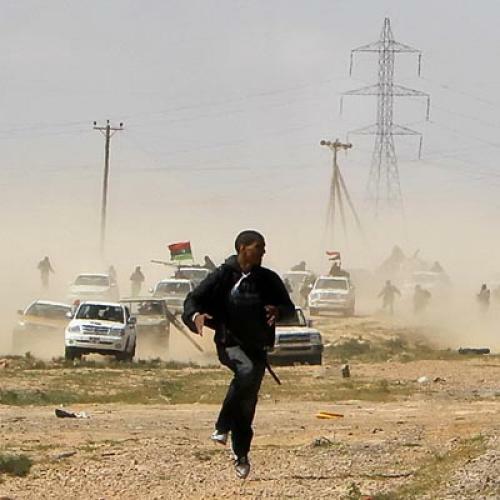 Why the Libyan rebels are struggling. Near Brega, Libya—Somewhere on the road between the cities of Ajdabiya and Brega, amid the wreckage of charred tanks destroyed by Western airstrikes, the Libyan rebels prepare their next advance. Armed with anti-tank missiles and rocket launchers, they look like a fierce bunch. But their panoply of Russian weapons, pilfered from the country’s military bases, paints a deceiving portrait of an advancing army. These undisciplined fighters do not even know how to properly clean their machine guns. The rebels have been fighting the forces of Libyan leader Muammar Qaddafi since a revolution erupted in the eastern part of the country on February 17. For the past five weeks, the two sides have been playing a game of hot potato, exchanging the towns of Ras Lanuf, Brega, and Ajdabiya. Last Friday, I accompanied them on another attempt to reconquer lost territory. Although Qaddafi’s army was humiliated in its last war with neighboring Chad, 24 years ago, and its elite forces are busy protecting the capital of Tripoli, it is not hard to understand why the rebels cannot advance. Rear units often fire on their own retreating forces, because they do not know how to aim their weapons correctly. They have not figured out how to create effective supply lines, abandoning vehicles at the front when they run out of gas. Many of the rebels have yet to pass Fighting 101. Some with sophisticated weapons do not know how to use the firing mechanism, shooting countless rocket rounds and squandering scarce ammunition. Lack of training is not the rebels’ only problem. They are undisciplined. Every car is its own platoon and every rebel is his own commanding officer. They advance during the day only to retreat at night, relinquishing the precious gains they have made. When one fighter prevented a comrade from advancing to the frontlines, a skirmish broke out between the two. Others joined in, and the scene soon looked like a pro wrestling brawl. Later in the day, as fighters were lingering around their Toyota Hilux pickup trucks, I spoke with a man who appeared to be a soldier. Dressed in dark olive fatigues, Muhammad Al Fituni was chatting with a group of rebels. I asked him how effective his Russian-made Dushka anti-aircraft gun was at targeting infantry and vehicles. “Oh, I don’t really know much about that. I am a petrochemical engineer, but since the oil installations are closed, I came to the front to join the rebels,” he said. With the rebels in disarray, their chances of advancing on Tripoli and overthrowing the regime are slim. Nevertheless, they believe that all they need to topple Qaddafi is sophisticated weaponry and longer-range rockets. But a former British commando who has spent the last month at the front disagrees. “You cannot just give a guy a rifle and make him a soldier. You need to train these guys,” says the man, who now works as a security specialist for a Western TV network. But such training would take months, and without it, the rebels are heading toward a stalemate with Qaddafi’s forces.